Discussion in 'Football Forum' started by van der star, Jul 9, 2018. Spanish Football Federation (RFEF) president Luis Rubiales said: "The decision was unanimous. I like his commitment and he has turned down better-paid jobs in order to coach Spain. "He's a coach who has all the requirements the federation was looking for." Needs to do something about that hair. Great appointment. Pretty sure he's going to do well. Should have been him instead of Hierro on WC. Think he’ll be a good appointment. His Barcelona team were far more direct than their predecessors, and a bit of directness is exactly what this Spain team needs. No, I think the Spanish FA or whatever they're called knew, what sacking Lopetegui meant for their WC campaign. Bringing a brand new permanent appointment into that situation is a bad idea. It's possible that they wanted shot of Hierro, too, and as such were more than happy to put him in front of the firing line. And sacked him in first place was stupid enough whatever the reason. Its WC not some friendlies. I am not sure the Spanish FA deliberately wanted to sabotage their country's hopes. 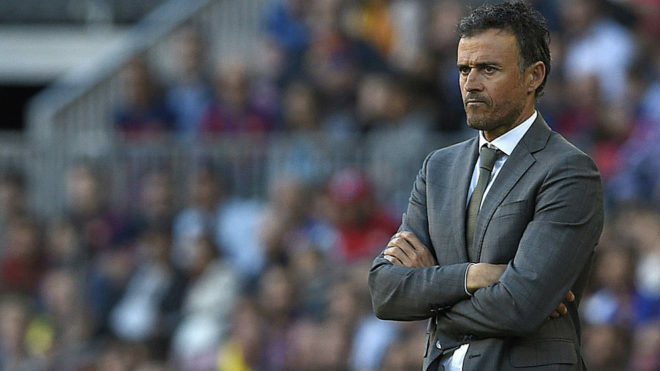 Keeping Lopetegui on was an option too much for them, but they wouldn't go the other way too far to overlook a potentially good replacement in Luis Enrique. I rather think Enrique made himself available now after looking at potential club jobs like Arsenal and Chelsea, and either rejecting them or getting overlooked himself for others. Either way, this is a solid appointment ala Mancini for Italy. I think this line of thought is overplayed. But yes. He'll be a good appointment. Good job that. Not much to do actually but to travel around and watch some football and occasionally pretend he's doing something. Good pay for what you have to do. I expect him to get the Luis Aragones treatment by the media, for those who don't know, Spanish press treated Aragones with the same love the Caf treated Van Gaal in his second season. I find it difficult to judge him as a coach personally. Barca team weren't great in year they won treble up to xmas and then M-S-N hit amazing form second half of the season that swept them to all 3 trophies. 7th in his one year at Roma. Did o.k at Celta but so did Berrizo. Personally think Spain need to move away from Ramos-Pique-Silva-Busquets era now. Some of them can still be starters but not all of them so of course difficult transition but Spain will always produce great talent. If he sets Spain up the way he got Barcelona to play, they'll be a force in competitions. Time to move on from Tiki Taka. What happened to all the talent they had? For years they looked like they could field 3 different great line ups. Heres their call up this week. Asensio, Rodrigo, Morata, Muniain, Jaime Mata. There are interesting players on that list. At least imo. Herrera would be with ease in that squad without the injury. He had a great chance of starting even. Their midfield is still good, but it is nothing like in the past. Worst Spain squad I’m years. No Pique, Koke, Costa, Thiago, Silva, Isco... plenty of players missing. Herrera should be getting in that squad no question. Players of the quality of Xavi etc. were always going to be hard to replace. But they still have quality players. After a slow start with the rest of Valencia, Parejo has had an excellent season. Statistically the 3rd best player in La Liga this season behind Messi and Suarez. Rodri(go) comes in at 7th in the league. So I'm sure on current form they are no more than a tier behind the big names that came before them.